Interested in being the SAS Global Forum 2021 Conference Chair? Apply Now! 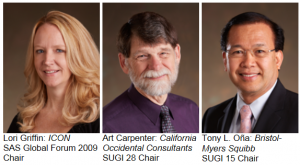 Each year the SAS Global Users Group Executive Board (SGUGEB) solicits applications for the SAS Global Forum Conference Chair for the conference three years from now. Individuals are identified, applications are requested, submitted applications are reviewed, candidates are interviewed, and finally a choice is made. We are asking for interested individuals to submit their application for SAS Global Forum 2021 Conference Chair. Yep, 2021! The SGUGEB wants to ensure that each conference chair has time to learn, gather ideas, generate ideas, learn from their predecessors and determine the focus for their conference. Is three years really necessary? Yep! The first year you will be working with the current conference team and begin to understand all the ins and outs of planning the content, organizing the content, and delivering the content. You will play a key role on the conference team, either on the Content Advisory Team or on the Content Delivery Team. This will help you in understanding the various roles and responsibilities of each team. In the second year, you will again play a key role on the conference team and will utilize the experience gained from the previous year to begin developing and determining your content focus, identify potential new initiatives, and begin to build your team. The third year is all about your conference and the implementation of the focus and initiatives you identified… all with the aid of your team of course. Good candidates should be active SAS users, authors, administrators, managers, and/or practitioners. Individuals should be active in the SAS community and other professional conferences and organizations as well. Good presentations and collaboration skills are a must. Also, candidates should have a vision on how they want to shape their conference to benefit the SAS Community. As an SASGF or Regional conference attendee, we have benefitted from the content and education we received. Those who have been a conference chair will tell you that it is an honor and a privilege to be able to shape the educational content delivered to our SAS Community. As conference chair for SASGF 2016, I can tell you it was one of the most rewarding professional and personal experiences I have had. I was given the opportunity to work with a lot of intelligent and talented individuals who, like me, wanted to ensure that current and future SAS users have a place to learn and grow professionally. With over 5,000 attendees and Livestream content available to millions, my institution had increased visibility, I developed additional leadership skills (by chairing such a large international conference), and I got to know and spend time with some exceptional SAS users, SAS leaders and executives. The experience was worth all the time and effort I expended. So, are you interested? If so, we invite you to peruse information about Conference Leadership and SAS Global Forum Conference Chair roles and responsibilities, as well as the many different volunteer opportunities that exist before, during and after SAS Global Forum, and then make an informed decision about whether to apply for conference chair. I would encourage anyone interested in applying to submit an application. Information on how to apply is available here. As well, share this information with anyone you feel would make a great conference chair and remember that the application deadline is February 18, 2018. Interested in being the SAS Global Forum 2021 Conference Chair? Apply Now! was published on SAS Users. And because SAS Global Forum attracts users from across the globe; in every industry imaginable; and from countless government and academic institutions, it really is a user event not to be missed. Thanks to the SAS Global Users Group Executive Board there are a couple of award programs in place to help those who might otherwise have a hard time getting to the event... well, get to the event! For relatively new SAS users who want to experience the conference for the first time, there's the New SAS® Professional Award. This award provides full-time SAS professionals with five years or less of SAS experience the opportunity to earn a free conference registration and one free pre-conference tutorial. You are eligible if you have never attended a SAS Global Forum in the past and would not otherwise be able to attend without assistance. A similar award, the SAS® Global Forum International Professional Award, provides users outside of the 48 contiguous U.S. states a similar opportunity. To qualify for this award, you must be a full-time SAS professional who has never attended a SAS Global Forum and would not otherwise be able to attend. This award provides free registration, including meals; one free pre-conference tutorial; and an invitation to an awards recognition luncheon on Sunday, April 8. Both awards are managed by SAS users who will assume leadership roles in future conferences. MaryAnne DePesquo, the 2019 SAS Global Forum Chair, is in charge of the 2018 International Professional Awards, while Lisa Mendez, SAS Global Forum Chair in 2020, manages the 2018 New SAS Professional Awards. Direct questions about either program to MaryAnne or Lisa. To be considered for either program, you must submit your application by Jan. 29, 2018. You will be notified if you received an award no later than March 5, 2018. Apply for the New SAS Professional Award. Apply for the SAS Global Forum International Professional Award. Professional Awards provide first-time attendees a chance to attend SAS Global Forum 2018 was published on SAS Users. SAS Global Forum is the premier worldwide event for SAS professionals. It brings nearly 5,000 users and executives from across the world together to share new techniques and technologies to help expand users’ SAS skills. But an event of this size (hundreds of presentations, dozens of workshops and several networking opportunities) doesn’t just happen. While SAS Global Forum is supported by SAS, the event is entirely planned and run by volunteers of the SAS Global Users Group and governed by an Executive Board charged with shaping the conference experience for fellow SAS users. Volunteers have been running the event since, well, before it was an event. It can be argued that the first event of SAS users occurred in 1974, when a two-hour “birds-of-a-feather” session of SAS software users was held at the annual IBM Share meeting. The following summer, SAS users met again for two days at Abbott Labs. These two gatherings were so successful that the attendees decided to plan an annual, international meeting of SAS users and the first annual International SAS Users Conference was held in Kissimmee, Florida, in January 1976. After this initial experience, this group of volunteers realized that they simply didn’t have the resources to completely execute a large conference. They asked SAS to help with mailings and print collateral and formed the original SAS Global Forum Executive Board to handle planning and execution. The board would select a chair from its members. Eventually, every member of the original board served as chair, so the board began selecting new chairs from among users who were actively using SAS and regularly attending the annual conference. These new chairs became Executive Board members as well. Today the Executive Board consists of 30 members and five SAS employees. These SAS experts have decades of technical and SAS expertise and are recognized as leaders in their chosen fields. Most importantly, though, they are fiercely dedicated to SAS and the user community. Enhance skills with SAS content and professional development. Increase understanding of all products and services provided by SAS. Gain access to a network of peers for collaboration and information exchange. Provide opportunities for feedback to SAS about their products, services, and policies. Because they have such an impact on the event, Executive Board members actively seek and welcome feedback from the user community. In fact, if you know any of the members, they encourage you to contact them directly with ideas for presentations or thoughts on how to make the conference even more valuable. (View the members of the SAS Global Forum Executive Board.) 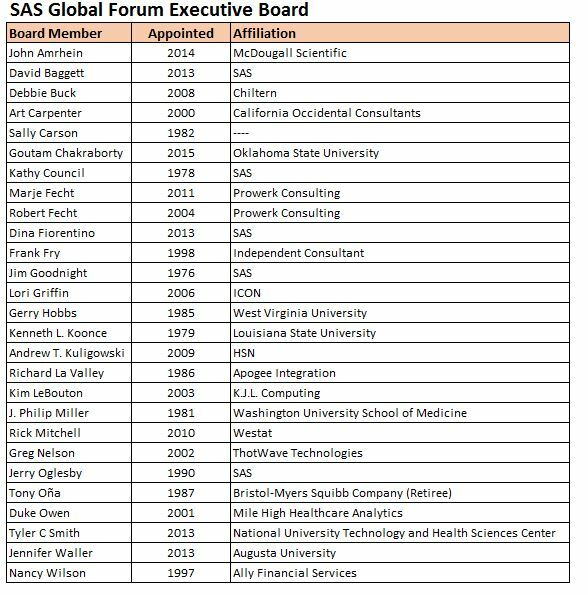 If you don’t know anyone on the board, please share your ideas with event organizers (sasglobalforumreg@sas.com) who will bring your suggestions forward. There are numerous volunteer opportunities and tons of reasons to volunteer. Jennifer Waller, This year’s Global Forum Chair and Executive Board member Jennifer Waller shares her thoughts on volunteering in her blog Can you help?” Volunteer opportunities aplenty at SAS Global Forum 2016. You can learn more about 2016 SAS Global Forum volunteer opportunities and sign up on our Volunteer page, or contact Global Forum’s Volunteer Coordinator at sasgfvolunteer@gmail.com. If you plan to attend SAS Global Forum this year, make your conference experience one to remember. Help the SAS Global Forum Executive Board shape the perfect conference experience by sharing your feedback and volunteering. Who knows, maybe one day you’ll chair a conference and become a member of the SAS Global Forum Executive Board. P.S. Nominations for the 2019 chair are open. Learn more. SAS Global Forum Executive Board: Shaping the conference experience for SAS users was published on SAS Users. The SAS Leadership Council: Collaboration evolved! SAS and SAS users have a great history of collaborating to build and improve SAS software. Soon, that history will be repeated (on a grander scale!) with the development of the SAS Leadership Council. The Leadership Council will be a team of seven SAS users and six leaders from SAS who will focus on strategic, operational and policy issues affecting the SAS community. The selection process for this team was developed by an interim working group comprised of SAS Global Users Group Executive Board members and select SAS representatives. Senior management: Business, technical or IT. Key industries: Health and life sciences, financial services, retail, government or education. Current SAS customer/user: Working with or for a company that is a current SAS customer or partner. Leadership experience: Vice president, director, senior manager, team leader or project manager. Recognized expert: Broad knowledge/familiarity or subject matter expertise. Once established, the Council will recommend Joint Advisory Teams (JATs). These JATs, similar to a task force or working group, will concentrate on focused short-term and long-term customer-facing projects. The JATs will also be a joint SAS and SAS user collaborative effort. Applications are being accepted June 11-25, and the inaugural SAS Leadership Council will take place in September 2012. If you have questions, please send an email to SLC@sas.com. In the months leading up to SAS Global Forum 2011, I want to give you a chance to get to know some SAS friends just a little bit better. I made my own list of people who have SASonality. SASonality means you have a love for SAS users, innovate with SAS, and give back. I made a list of people I’d like to interview, and I asked you to send me names of people you’d like to learn more about. The first person on our list is Don Henderson. Don is a member of the SAS Global Users Group Executive Board. You can connect with Don at sasCommunity.org. Why do you attend SUGI/SAS Global Forums? Do you still learn new things about SAS? Mostly it is to catch up with other folks in the SAS community who I've known for a long time. Yes, I do learn a few things here and there. But, another reason is that I don't want to break my string of consecutive conferences. I’ve been to every one of them since SUGI 3, including the last time we were in Las Vegas. What is your title? Developer, programmer, analyst, etc. How do you use SAS at your organization? My title is pretty boring. I'm an independant, single person consulting firm, and so, I typically refer to myself as "Principal" but those folks who've known me for a while know that I also refer to myself and a "Senior Level Lackey". A lot, though not all, of my work is SAS-related. What I do runs the gamut from business analysis, to process consultant to architect to designer to programmer. Who was your first mentor in SAS? Do you think mentorship is important? That is a tough one. When I went to work for the USDA in 1975 right out of school, my boss handed me the SAS manual (yes, it was one book) and told me to learn it. Within a year of that, SAS ended up striking a deal with the USDA, and I became what you would now call the site rep where SAS did their development on the USDA mainframe. In some sense, it was Jim Goodnight, Jim Baar and John Sall who were the folks who mentored me in their software. And yes, mentorship is important. I am a big fan of the master-apprentice model of getting work done. I've had a lot of other folks I've learned from throughout the years. I'm smart enough not to list any names, because I know I'd forget a few. The folks who've been important to guiding my professional and personal life know who they are! I'm not sure how to answer that one. I just do. Because I have been very active and very involved in the SAS community for more than 35 years, I know a lot of folks and a lot of folks know me. So, I really don't have to do anything other than keep in touch. That's not really an answer, but I really don't know what else to say. I love photography and to work in the yard; I can't tell you how many problems I've solved while cutting the grass. Traveling - for pleasure, not work - is something I really enjoy. I guess the thing that makes me who I am is the skeptic and contrarian in me. I love to have a good debate, and I will often take a position contrary to everyone else just to force myself and others to truly think about things. Sometimes, more than I'd like, I dig myself into holes. But so far, I've been able to dig my way out. I also think that this characteristic is what has made me reasonably successful as a consultant. A good consultant should always be questioning why. I also love problem solving - regardless of what the problem is. Give me a scenario and let me try to abstract it and figure it out. Will you be presenting at SAS Global Forum 2011? I don't think so. But, I've found out way after the fact that colleagues have put me down as a co-author and told me about it when it’s too late to say no. But I don't think that will happen this year. You said before that this won't be your first SAS conference in Las Vegas. What were some of the other trips, and what are you most looking forward to? Absolutely, the first time was SUGI 3. I've also been to PBLS and the M-series Data Mining Conferences the last few years as well. I am looking forward to catching up with my SUGI/SGF colleagues. What is the most interesting SAS project that you have ever worked on? That's an easy one. Way back in the 1980s, I was the Project Manager and Tech Lead on a contract with the Bureau of Labor Statistics to rewrite the processing system for the 1987 Revision of the Consumer Price Index. Between the code for the new system, the cutover code and the various ad-hoc type applications we had to write, it was close to 750,000 lines of SAS code. While I've worked on lots of interesting things since then, I would have to say that project was the most interesting and the one that I learned the most on. What do you read to keep you on your professional toes? Frankly, I am not much of a reader. The way I keep sharp technically is to look for the hard projects that no one else wants to do - you know, the burning buildings. Such projects are frustrating as all get out, but they keep me sharp and on my toes. I love SciFi. If not for the fact that I am terrified of heights (don't ask me to climb a ladder or even stand on a chair), I've always fantasized about being an astronaut and traveling to another planet. In coming weeks, you’ll hear from SAS users who have outstanding SASonality, including Sy Truong, Phil Holland, Carole Jesse and Phil Miller. I have interviews lined up with SAS insiders with SASonality too. Don’t miss these greats: Diane Hatcher, Rick Wicklin and Rick Langston. Do you have a question you’d like to ask? Let me know who you think has SASonality? 1.) Where I could find you if you weren’t at a users group conference? You’d find me outdoors. In winter it’s skiing (x-c and downhill) and in the spring-fall it’s hiking, mountain biking and camping. 2.) How many times have you been to SAS Global Forum, and what was your most memorable experience so far? 2009 will be my 12th conference. Which is interesting since I guess that means my conference in Seattle will be lucky 13! (1) Getting an early peek at the next releases of SAS reporting procedures and tools with developers Sandy McNeill, David Kelley, Dan O’Connor, Eric Gebhart, and others. (3) Bumping into someone who it turns out is doing the same sort of obscure analysis I’m currently working on. I met a woman at lunch one year who was analyzing data from the same medical device as a clinical trial that I was working on, but she was in a completely different field. It was fun to trade notes on how we dealt with data and analytical issues. 3.) What was your “official role” at SAS Global Forum 2009? I was the chair of the Industry Solutions section. I worked with my team of eight Industry Solution Leaders to find keynote speakers, SAS speakers, customers, and contributed papers to cover the topics of interest to people in the Life Sciences, Financial, Communications, Retail, Education, Government, Customer Intelligence, and Energy industries. 4.) Who are the major players that produce SAS Global Forum ? 1. The conference volunteer team: The conference chair and section chairs provide the ideas and the contacts in their industries or areas of expertise. Thanks to them, we can bring attendees the latest information and practical advice that’s relevant to their day-to-day work. 2. SAS: SAS provides a lot of logistical support, and gives us access to top presenters who can teach us about features of upcoming releases of the software. 3. The SAS Global Forum Executive Board is responsible for picking the conference chair, and providing advice and support to the chair. The Executive Board also focuses on projects such as sasCommunity.org that provide benefit to the entire SAS user community, not just those who attend SAS Global Forum. 5.) What new things are you thinking about trying for SAS Global Forum 2010? Given the economic times, a big focus for me will have to be finding ways we can control our costs without adversely affecting the content of the conference. I will also be working with my team to come up with documentation that potential attendees can use to convince their managers that SAS Global Forum is one of the most cost-effective educational opportunities out there for SAS professionals. As a manager, another area of interest for me is expanding the content we have available for front-line managers of SAS professionals. This includes management seminars, presentations, panel discussions, and technology briefings.